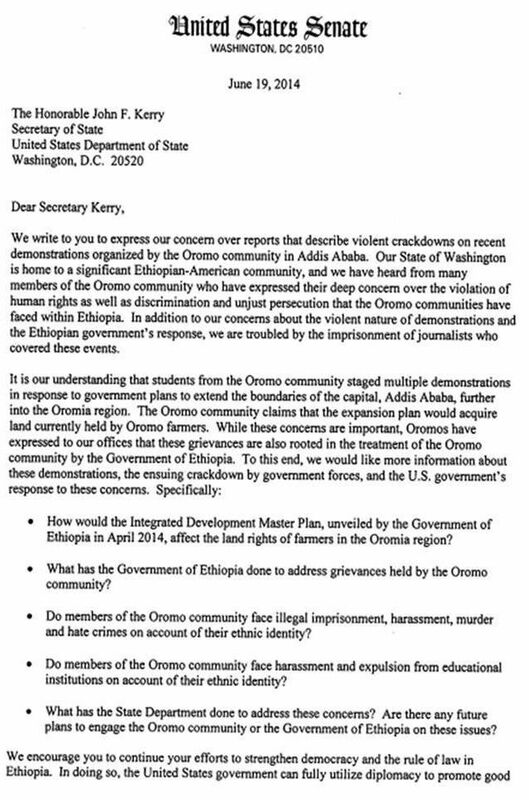 Leading up to this letter, it’s to be remembered that several members of the Oromo community in the State of Washington staged a 3-day hunger-strike earlier in June 2014 in front of Seattle’s Federal Building to draw attention to the violent response of the Ethiopian government to the peaceful demands raised by #OromoProtests in college and university campuses across Oromia in April and May 2014. The killings and imprisonments of Oromo students and civilians by the TPLF Ethiopian regime have continued unabated, in violations of local and international human rights laws. Galatoomaa yo jabaanne ammallee waan guddaaa akka hojjannu shakkiin hin jiru. Thank you Sen. Maria Cantwell and Sen. Patty Murray for your support of the Oromo students. What really happened remains beyond any civilized Nation’s comprehension. In its sinister agenda it was/is a plan to impoverish the Native Oromo citizens by removing them from their ancestors land and sell it to foreign investors in the fake disguise of “plan for development”. The money generated by selling these pieces of Oromo Lands directly goes to the Bank accounts of the TPLF crook government personals, while the Oromo citizens become homeless and goes around the cities to beg for their daily survivals. Inflamed by the above criminal plan against their Nation, University students from different Oromian Universities of Ambo, Guder, Adama, Jimma, Neqemte, Gimbi, Robe, Haro Maaya, Dire Dawa and other Oromia district High Schools, with their parents including dwellers of various villages took to the streets of Finfinee/Adiss Ababa, provisional municipalities, and other cities, town and villages for peaceful demonstration to express themselves peacefully, but in unequivocal opposition of this heinous so-called master plan. Thank you Senators again for becoming a voice for the voiceless!!!!! While I greatly appreciate the senators efforts I am disappointed that the letter doesn’t contain any mention of massacres and genocide taking places even while Kerry was in the country and continuing to this date. I seriously suspect that Kerry pays any attention to these letters because he praised the “cranes” and “constructions” on farm land while paying blind eyes to the farmers themselves. That is why I urge ALL Oromos and concerned human rights activists in North America to go to the White House, UN, IMF, world bank to stage one week of hunger strikes urging the US president and the world bodies to stand on the right side of history and avoid further genocide by Tigrian regime. Hunger strikes must continue not until some letter is written but until a specific action is taken to stop ongoing genocide. Many thanks to Sen. Maria Cantwell and Sen. Patty Murray, I am living in Oromia Regional State, the harassment and killings of Oromo students, farmers and civil servants have reached peak at a moment following protests against annexations of Oromia land to Finfinne (Addis Ababa).